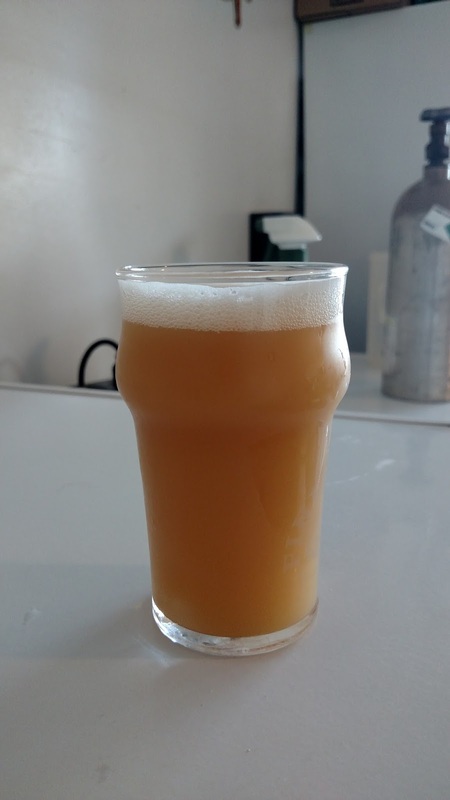 Squeegee is a session IPA that I decided to brew at the end of the summer. I wanted something I could have on tap that would also broaden/sharpen my brewing skills. It's nice to keep other things going along side all my farmhouse beers. You can find the original post and recipe here. Appearance: Light straw and hazy as can be! You can't see through it at all. It's like a pale orange juice color. Soft white head full of tiny bubbles. It's streaming up the sides of the glass from what you can see on the outside. Very reminiscent of the Northeast IPAs I've had. I really need a better camera and better lighting! Aroma: Wow... Super pungent. Definitely get the citrus notes. Really big grapefruit. There is also a good bit of tropical fruit notes. Some mango maybe and a bit of a fruit punch. There is also a white grape juice hint. Basically it smells like white grape juice infused fruit punch with bits of grapefruit rind/flesh floating in it! One of the best noses I've had on one of my homebrews. Flavor: Yup, grapefruit to follow the nose. A bit of sweetness in the mid palate. It's again like a fruit punch sweetness. Not overly cloying at all. Finishes nice and dry with a bit of a grapefruit pith acidity. Nothing acidic about the beer really just has the dryness one would expect with acidity. I could drink this for days. Mouthfeel: Medium mouthfeel with maybe a touch on the medium heavy side. The oats and spelt give it a super creamy feel. Really nice and pleasant to drink. Overall: I'm very happy with how this turned out. It's been a long while since a brewed an IPA or even a clean hoppy beer really. It was nice to visit this and know that I can do it to keep something on tap for everyone who comes to my house. I intended on taking this tailgating at the last MSU home game but all 3 growlers were taken down the night before. Even folks that aren't big fans of craft beer liked this one. Not having an early addition of bittering hops really played a part in this I think. It has all the hop aroma and flavor your could want without being overly bitter. It also doesn't overplay the malt or low alcohol level. It's balanced but has a "hit you in the face" aroma. I loved the hop combination as well. Galaxy is such a crazy hop that does well when paired with others. Amarillo is just one of the best hops ever produced. Rakau was the new comer for me but I definitely think it added to the whole package. This is definitely one to be repeated!